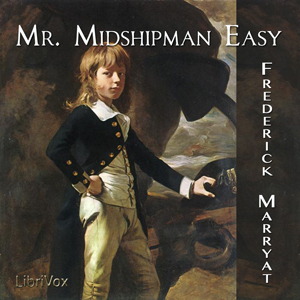 One of the first novel-length pieces of nautical fiction, MR. MIDSHIPMAN EASY (1836) is a funny and easygoing account of the adventures of Jack Easy, a son of privilege who joins the Royal Navy. The work begins as a satire on Jack's attachment to "the rights of man" that may try the listener's patience. But despair not, for the story soon settles down as the philosophical midshipman begins his many triumphs over bullies, foul weather, and various damned foreigners of murderous intent. Caveat audiens: This novel employs racial/ethnic epithets and religious stereotypes, as well as taking a rather sunny view of supply-side economics. In short, there's something here to offend almost everyone.